Hovercraft Training Centers’ Senior Instructor Chris Fitzgerald just returned from the Dominican Republic where he conducted a week of flight training at Barrick Gold Corporation’s Pueblo Viejo gold, silver and copper mine. Their Neoteric hovercraft will be used for the mine’s exceptional biodiversity and environmental projects, as well as for surveying and safety & security. A hovercraft is the only vehicle able to travel over the hazardous sections of the mine’s five tailings ponds. And it’s only natural that the Neoteric HoverTrek™ - with an environmental impact less than that of a seagull standing on one leg - was the vehicle of choice for Barrick, the most ecologically conscious mining company in existence. 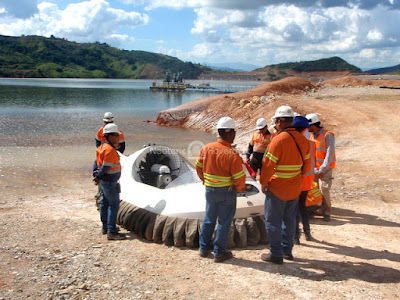 The mine purchased its hovercraft in 2012, but without training it was passed from department to department and eventually left to sit idle in a maintenance yard where it became damaged. It was discovered in 2015 by the mine’s Department of Biological and Ecological Sciences, who requested that they take charge of the craft. Next, they arranged onsite maintenance and pilot training with Hovercraft Training Centers. 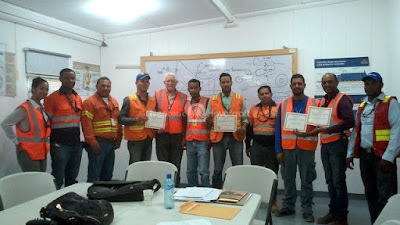 Eleven employees completed classroom and maintenance training and four of them underwent flight training. At the El Llagal Tailings Pond, trainees prepare to launch the hovercraft for flight training. A large area of the pond is filled with muddy clay, consisting of fine red particles and water. 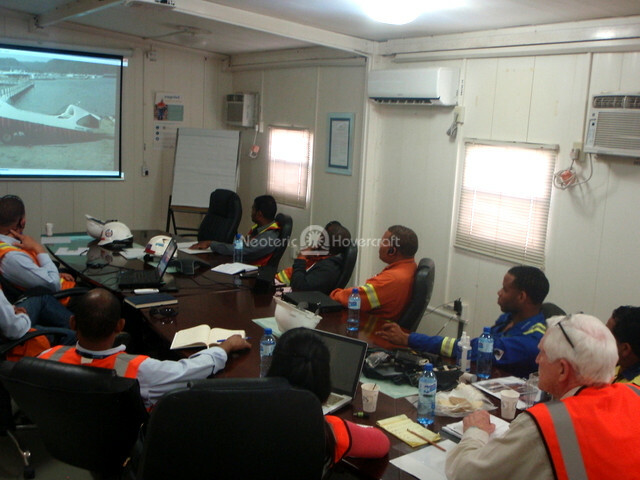 Headquartered in Canada, Barrick Gold Corporation is the world’s leading gold mining company, with operations on five continents. The Pueblo Viejo mine is one of the largest gold mines in the world and is the biggest single investment ever made in the history of the Dominican Republic. Over the 26-year life of the mine, it will produce an annual output of 700,000 ounces of gold and 3,270,000 ounces of silver. You can see the mine’s economic output when you consider that, in US dollars, the current value of gold is $1,196 per ounce and silver is $16 per ounce. 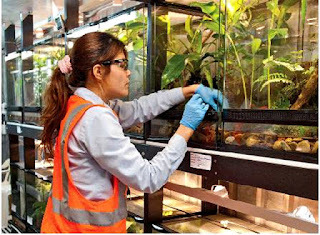 As an example of the company’s emphasis on biodiversity and the environment, Barrick’s Department of Biological and Ecological Sciences is spending more than $2 million on a project to study and preserve several endangered tree frog species that would be impacted by its Pueblo Viejo mine. The project includes a captive breeding program with two facilities – one in the El Llagal Valley where the frogs live and another at the Santo Domingo Zoo. The project resulted in the frogs’ reclassification from ‘endangered’ to ‘vulnerable’ by the International Union for the Conservation of Nature (IUCN), a process known as down-listing. 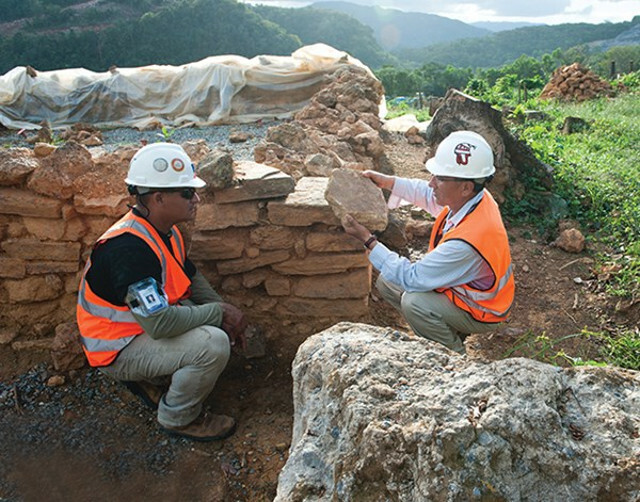 Barrick also operates a large archeological program in and around the Pueblo Viejo mine. In 2010, this effort resulted in the discovery of artifacts revealing that Pueblo Viejo is the first mine in the Americas, built by colonists after Christopher Columbus discovered America. Excavations also unearthed the remains of a small colonial Spanish Church and miners’ living quarters dating back to 1513. These valuable ruins were carefully relocated and preserved. Other historical finds include bones, pottery and art – including a German beer stein preceding Columbus’ time, and a glazed stoneware stein engraved by the renowned German Renaissance artist Albrecht Durer. Their frog project, their archeological program – and proper training on their Neoteric hovercraft – are just a few of the many ways Barrick is endeavoring to protect and preserve the environment, wildlife and history of Pueblo Viejo. The company is also conducting the largest environmental cleanup in the country’s history, reversing damage caused by a mining operation that closed without proper remediation in 1999.